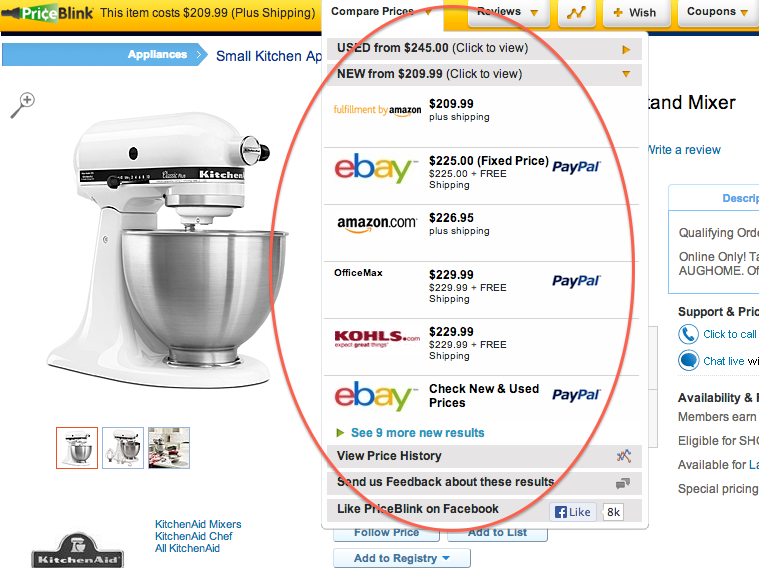 Priceblink: Still the easiest trick to save money shopping online. When I first installed Priceblink for my browser a few years back, I called it one of my top tech picks of the year. 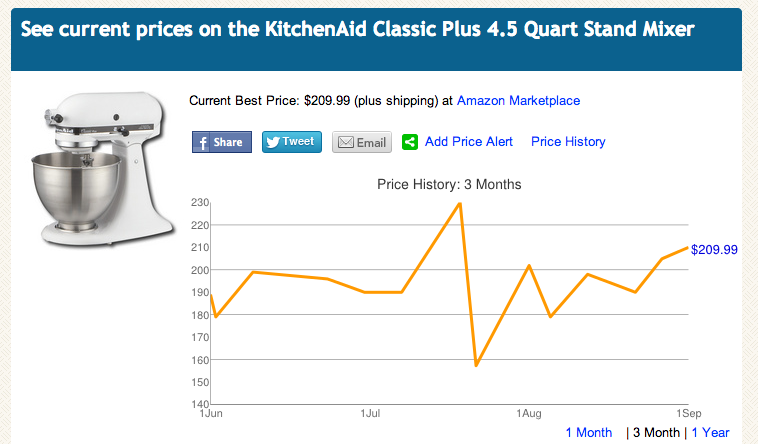 Since then, this amazing online price comparison tool has come a long way. And you’ll definitely want to check it out, especially if you plan on taking advantage of the big online Labor Day sales today. Install the Priceblink add-on for Chrome, Safari, Firefox and Explorer (aw…are people still using Explorer? So cute) and you’ll start finding the best prices without even going to a single search engine because it all happens automatically, when you’re on a retailer’s site. Check out a name-brand product, and a yellow can’t-miss alert bar at the top of your browser appears with a drop-down list listing other shops that sell the item for less–or sometimes more. It also gives you a list of online coupons you can use. 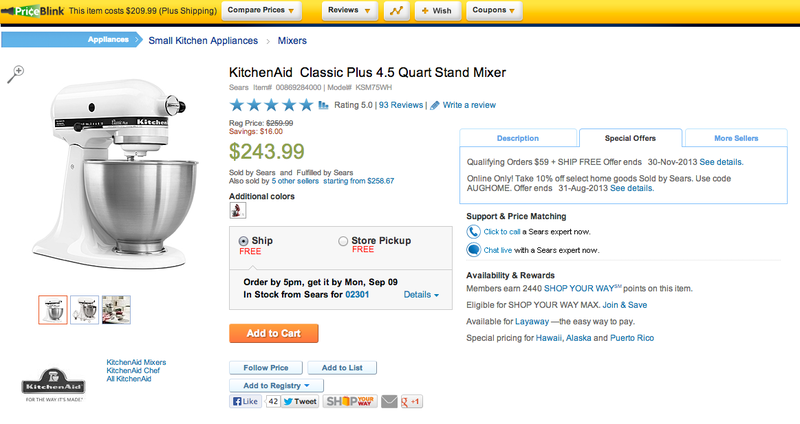 For example, I clicked on a KitchenAid Stand Mixer on sale at Sears (Big Labor Day savings! $16 off!) only it turns out I can get it for $14 below that with free shipping at Office Max or Kohl’s–places I’d never have thought to check on my own for a mixer. It also indicates in the drop down menu that Office Max takes Pay Pal, if that’s important to you. One big tip: Make sure you check shipping prices! While it seems tempting that the item is available for $34 less at a few other places, they compensate for that with high shipping costs. $35 shipping? No thanks, Mr. Amazon Third-Party Seller. 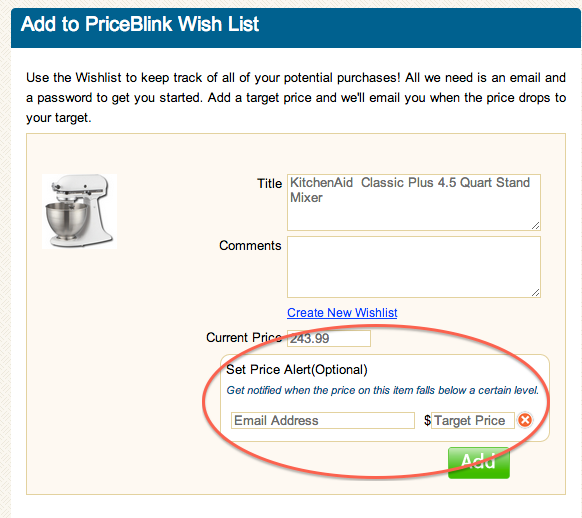 I also like the new Priceblink Wish List which is more than just a registry; add the item and you can sign up for email alerts when the price drops to a number you specify provided you’re willing to register or sign on through Facebook. So smart for big ticket tech items or appliances. I have seriously saved hundreds of dollars just having this free extension on my browser. Let alone the hundreds of hours of time not having to click around for better prices. Yay, technology. Visit Priceblink.com to comparison shop on their site, or better, install the Priceblink add-on onto your browser. Yes, even IE.